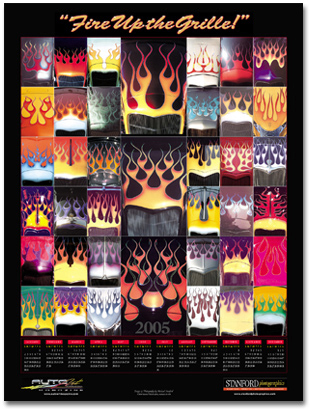 Dramatically displaying the color and vitality of hot rod flames, these thirty-nine images, collected from numerous Southern California hot rod shows, showcase the talent and versatility of some of the finest custom painters working today. Each poster is signed by the photographer, for whatever that's worth. ($8 shipping and handling outside US). We're also required to charge sales tax in California  even on internet sales  which is 62 cents per poster. Sorry. Posters are shipped rolled in a heavy 3" diameter tube. Its suggested that the poster be laid flat upon arrival to prevent permanent rolled edges. We recommend backing the print with corrugated or foam core and framing it behind glass in an appropriate 18 x 24" frame of your choice. Or you can just pin it to the wall. Whatever. We have a quick and easy PayPal ordering and payment system. Click on Add to Cart and It takes you to a special PayPal page and returns you here after processing. If you already have a PayPal account, its ultra simple. If not, its still simple: theyll accept your credit card and ask if you want to sign up with them, which is actually free and not a bad idea. Your poster(s) will be mailed out to you as soon as we receive the confirmation. And thanks for shopping at Stanford PhotoGraphics! If youd prefer the low tech, mail order process, click here for a *PDF form you can print and FAX back with credit card information or MAIL back with a check, credit card info or money order. Your poster(s) will be mailed out to you as soon as we receive the form. * You need the Adobe Reader to view PDF files. If you don't have it, click here for a free download.